Stefano Boeri is one of the few practices of international renown that has managed to overcome the difficulties intrinsic to the situation Italy presents for architecture studios and to make of these a virtue. His career as an architect has gone hand in hand with a commitment to teaching, criticism, publishing, politics and cultural agitation, and the projects he has tackled in these fields are numerous. To this we might add an abundant oeuvre—unusually productive in terms of Italian parameters—including public and private buildings, extending from apartment blocks and offices, a shopping mall and a small art centre in Milan, to more paradigmatic works like the remodelling of La Maddalena Arsenal (Sardinia), the apartment towers of the Vertical Forest in Milan and the Centre Régional de la Méditerranée in Marseille. 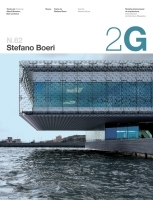 Two introductions, by critics Alexei Muratov and Bart Lootsma, provide a framework for Stefano Boeri’s personal trajectory in the Italian and international context, while the “nexus” section presents a text by the architect himself and a set of graphic materials that, akin to a professional biographical album, sum up the complementary activities that have shaped the career of the Milanese architect.